Minority governments, although relatively rare in Canadian parliamentary history, have played important roles in Canadian politics. This article introduces minority governments, providing information on how governments are formed in Canada, differences between minority, majority and coalition governments, how minority governments govern, as well as some benefits and drawbacks of minority governments. What strategies do minority governments use to stay in power? Credits: This article was initially written by Rhonda Lauret Parkinson. It has since been altered and updated by Jay Makarenko. Minority governments are ones in which a single political party forms the government without holding a majority of seats in the legislature. Instead, they only hold a minority of the total seats — hence, the term "minority government." To understand this type of government further, it is important to examine key concepts in Canadian parliamentary politics, such as the Prime Minister and Cabinet, the notion of responsible government, and the role of political parties in forming governments. In Canada, the term “government” refers to the Prime Minister and his/her Cabinet (in the case of provincial/territorial legislatures, it refers to the Premier and his/her Cabinet). These persons lead the nation and decide important issues of governance; for example, how much money the state should tax and spend, what the nation's laws should be, and what programs and services the state should offer. In essence, the Prime Minister and Cabinet represent the pinnacle of executive political power in Canada. The Prime Minister and Cabinet, however, are not completely free to govern the country as they wish. Rather, they are responsible to Canadian voters indirectly through a process called "responsible government." Under this process, the Prime Minister and Cabinet can only govern so long as they have the support of the majority of Members of Parliament (MPs) in the nationally elected legislature, which is called the House of Commons. These MPs, in turn, are responsible to the voters during general elections — voters may decide to re-elect their incumbent MP or vote for a new representative. It is through their democratically elected MPs, then, that the government in Canada is responsible to, and held accountable by, the Canadian people. Political parties play an important role in the process of forming and maintaining governments; the political party with the most MPs elected to the House usually forms the government, and the leader of that party usually becomes the Prime Minister. Why is this the case? Remember, under Canada's system of responsible government, the Prime Minister and Cabinet must have the support of the majority of MPs in the House of Commons. As such, the leader of the political party with the most MPs in the House generally has the best chance of gaining this majority support. S/he can use party discipline to ensure the greatest amount of votes in the legislature. Finally, governments can be categorized according to the precise number of MPs they have in the House of Commons. A majority government is the most common form of government in Canada. Under this type, a single political party has more than half of all the MPs in the House. Because this government has a clear majority, it is referred to as a "majority government." In such governments, the Prime Minister and Cabinet have an incredible amount of control over the government policy and direction. S/he can enact whatever policy they like, and then exercise party discipline to ensure that those policies are supported in the House (and enacted into law). The only threat to such a government is internal dissent and a revolt by the governing party's own MPs (which rarely occurs in Canadian politics). In some cases, however, no single political party has a clear majority of MPs in the House. The political party with the most MPs, nevertheless, may decide to form the government on its own. This is called a minority government because the governing political party only has a “minority” of MPs in the legislature. A minority government governs much differently than a majority government: because it does not have a clear majority in the House, the government cannot simply use party discipline to guarantee support in the legislature. Instead, it must negotiate with opposition parties to gain their support for government legislation. See the Governing as a Minority Government section of this article for more information on how minority governments govern. Minority governments can also be contrasted with coalition governments, a third type of government within a parliamentary system. Under this type, two or more political parties (with a combined majority in the House) enter into a formal agreement to form the government together. While both coalition and minority governments can result from situations in which no single political party has a clear majority of MPs in the House, the two should not be confused. In minority governments, a single political party forms the government alone and then seeks informal cooperation with opposition political parties. In coalition governments, two or more political parties enter into a long-term agreement to form the government together, to the exclusion of all other parties in the legislature. Unlike majority governments, minority governments cannot automatically count on receiving majority support in the legislature. This means that minority governments must develop unique strategies, beyond simple party discipline, to ensure it can stay in power and govern. The following discusses some of these minority strategies, as well as what occurs when a minority government falls or ends. One approach to minority government is for the governing political party to negotiate support in the legislature in an ad hoc, case-by-case basis. Under this situation, the governing political party will seek support from different opposition parties depending on the particulars of the legislation it wishes to pass. In doing so, the government may strike a deal with one or more opposition parties on one piece of legislation, and then look to make deals with other opposition parties on other legislation. Such a form of minority government is highly unstable, as it depends on the governing party being able to strike ad hoc compromises with alternating political parties over a long period of time. Examples of this type of minority government include the federal Liberal government of Prime Minister Paul Martin (2004-2006) and the subsequent minority government of Conservative Prime Minister Stephen Harper (2006-). Another type of minority government involves a loose alliance between two or more political parties with a combined majority in the legislature. Under this situation, the governing political party strikes an informal deal with other political parties to ensure majority support. Often this involves the governing party taking on certain policies that are central to the other parties' platforms. It may also occur as a result of the other parties desiring to "prop up" the governing party in order to stop another party from taking power. Such alliances, however, stop short of full coalition governments in that the governing party alone assumes all key government positions (the other parties' members do not, for example, sit in Cabinet). Moreover, they differ from ad hoc minority governments (see above) in that the alliance will involve particular political parties over a period of time (as opposed to the governing party striking deals with alternative opposition parties on a case-by-case basis). Such alliances rarely occur in Canadian minority situations, as political parties usually cannot cooperate to such an extent for any period of time. A third type of minority government involves a formal agreement between two or more political parties with a combined majority in the legislature. Under this situation, the governing political party will strike a deal with one or more opposition parties for support. This type of minority government differs from a loose alliance in that it is based upon a formal agreement that stipulates the length of the cooperation and the precise obligations of each party. Again, such a minority government should not be confused with a coalition government, as the partner parties do not sit in Cabinet. An example of this type of minority government is the Ontario Liberal government between 1985 and 1987. In that minority government, the opposition New Democratic Party agreed to support the governing Liberals on all confidence motions and budgetary legislation for a period of two years. In exchange, the Liberals agreed to enact certain legislative measures proposed by the NDP. What exactly occurs when a minority government falls or ends? It is possible, though not common, for a minority government to govern for its full term. However, in most cases a minority government will fall prematurely. This can occur whenever the governing party fails to secure majority support from other parties on confidence votes in the legislature — in most cases on the budget vote. In the case of an ad hoc minority government, it may be that the governing majority simply cannot strike a temporary deal with one or more opposition parties. In the case of loose alliance and formal agreement minorities, it may be the partners can no longer cooperate with one another. It is important to note that parties (including the governing political party) will often intentionally force the fall of a minority government if it views the calling of an election to its advantage. The governing political party, for example, may recognize that its popularity in the polls is such that it could be elected to a full majority government if an election where called. As such, it will end its government by calling an early election, or will attempt to trigger the fall of its government by introducing confidence legislation that it knows opposition parties will not support. Opposition parties may also attempt to trigger an election if it is to their advantage, and can do so by voting against a piece of government confidence legislation, or by simply introducing a motion of non-confidence in the legislature (a motion declaring that the legislature no longer supports the government). It is generally the case that, once a minority government falls, a general election is held in which voters have an opportunity to elect new representatives. In some cases, this can lead to a majority government for one of the parties. In other cases, such as the 2006 federal election, this can lead to another minority government by a different political party; the minority Liberal government was replaced by a Conservative minority government. In Canada's House of Commons, however, it is not necessarily automatic that an election be held. Theoretically, the Governor General of Canada has the power to simply ask one of the opposition parties to form a new minority or coalition government instead of calling a general election. Such a situation occurred in 1925 with the minority government of Liberal Prime Minister Mackenzie King. Following a government scandal, and loss of support in his government by the Progressive Party, Prime Minister King asked Governor General Lord Byng to dissolve Parliament and call a general election. Byng refused, and called on Conservative leader Arthur Meighen to form the government. Today, however, it is very unlikely that a Governor General would act in the same manner as Byng, as it is no longer customary for the appointed Governor General to interfere in the democratic politics of the elected legislature. 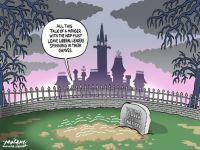 Minority governments have been common at both the federal and provincial/territorial levels in Canadian history. The following provides a historical review of federal minority governments in Canada from Confederation to 2007. In 1925, Mackenzie King’s minority Liberal government agreed to implement old age pension legislation to keep the support of Progressive and Labour Party MPs. The legislation was implemented in 1927. In the 1960s, Pearson's minority Liberal government introduced several key components of Canada's modern social-welfare system, including universal health care, government loans for university students, the Canada Assistance Plan (CAP), and the Canada Pension Plan (CPP). These initiatives were in part due to the close cooperation between the Liberals and New Democratic Party during Pearson's minority governments. Between 1972 and 1974, Trudeau introduced a program of economic nationalism that included the creation of PetroCanada. In addition, old age pensions were indexed to the cost of living. Again, this was due in part to the close cooperation between the Liberals and NDP during Trudeau's minority government. Responsiveness: Minority situations make governments extremely responsive to the views of MPs. Instead of government policy being decided by the Prime Minister and Cabinet — with elected members simply following party discipline — governments are forced to take into account the views of its own elected members and the views of other parties to ensure that legislation is passed. Accountability: A minority or coalition government is also more accountable. This is especially true of minority governments that depend on other parties' votes. Opposition parties can hold a government accountable for its actions very effectively by threatening or actually undertaking a vote of non-confidence or voting down government legislation. Transparency: Minority or coalition governments force a lot of communication between parties. For the governing party to pass bills, it must inform other parties of its intentions. This higher level of communication makes government policy much more public and, as a result, much more transparent. Instability: The major weakness of minority governments is their tendency to last for only a short period. Consequently, governments are often unable to fully pursue their policies or mandates before the coalition or negotiations with other parties collapses. The average duration of minority governments in Canada is approximately 18 months. Inconsistency: Because minority governments have to negotiate with other parties regularly to get legislation passed, it is difficult to bring consistency to government policy. The governing party may have to compromise with one party on one issue and then compromise with another party on a different issue. This is particularly problematic in economic policy where government actions in one area can negate or defeat government actions in another area. Inefficiency: The constant demand for negotiation can slow government down considerably. Instead of being able to take swift action on demanding issues, governments are forced to engage in lengthy and tedious negotiation with other political parties. This can be extremely problematic with issues that require immediate action, such as foreign policy and the budget. Blameless government: Minority governments open the possibility for less accountability. This is because the different parties are working together in making government policy. Consequently, it can be difficult to locate blame when policy goes wrong, as the different parties may simply blame one another. Any Room for a Uniter?